Feargus Urquhart says one of the biggest stumbling blocks to a Fallout: LA isn't Bethesda, but consoles. 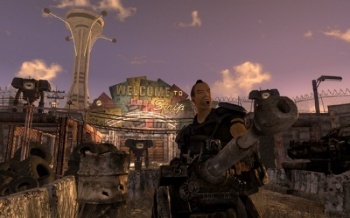 Feargus Urquhart, CEO of Obsidian, would love to do a Fallout: New Vegas 2, except that it wouldn't necessarily be set in Vegas. He's looking a bit further west, at Los Angeles, and dreaming of what might have happened when the bombs started dropping. "I think if we were to do Fallout: New Vegas 2 - or just a new Fallout - we would probably separate it from what the internal team at Bethesda's doing," Urquhart says. "We'd keep it on the West Coast, because we're West Coast people. They're East Coast, so it makes sense." Just a short distance away from Vegas is the City of Angels, a pleasant - and from Urquhart's perspective, usefully confined - spot for some mutated jollies. Urquhart sees it as a mix between Walking Dead survival-style horror and Fallout, thanks to all the radiation. Urquhart acknowledges that his dream is just that, for the moment, but says that Obsidian's good working relationship with Bethesda means that there are fewer obstacles than there might otherwise be. The big problem, as he sees it, is "basically, what does all the console crap mean?" So long as there's an air of indecision about whether the next generation is actually coming out soon, developers won't be eager to dive headfirst into new projects. Add that to mobile and F2P, and you get a volatile mix that, Urquhart believes, is putting a lot of developers off new projects. "So that's a lot of the conversation we've had with publishers," Urquhart says. "'OK, how do we get back to normal - whatever normal is going to be.' That's just the process right now." Don't hold your breath, is the upshot of all that; but there's always a chance that, if the new normal emerges sometime soon, we may yet see what Obsidian could do with a mutant-infested La La Land.